Gloria Davis, an activist with the Chicago Coalition for the Homeless, speaks Wednesday at a panel on minimum wage in University Hall. The discussion took place days before citizens will vote on an advisory referendum to increase the Illinois minimum wage to $10 an hour. 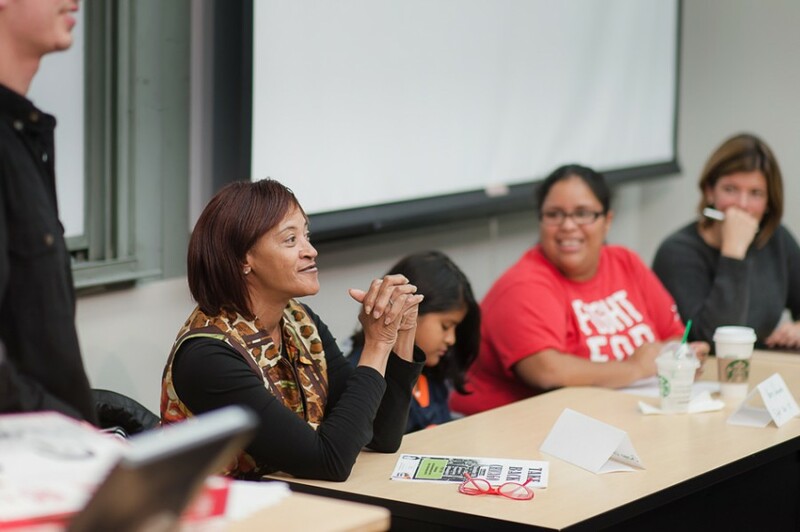 A raise in the minimum wage affects not only workers, but the entire community, said McDonald’s employee Nancy Salgado at Northwestern on Wednesday night. Salgado is a member of Chicago’s Fight for 15 campaign, which is working to raise minimum wage to $15. She spoke to about 60 students at University Hall during a panel discussion about the benefits of raising the minimum wage. “I support the Fight for 15 knowing that it’s not only the workers, but it’s also you guys in solidarity with the workers, because what we’re fighting for is pretty much the future for all of us,” Salgado said. The event took place days before Illinois voters will vote on an advisory referendum on raising the state minimum wage from $8.25 to $10 an hour. Wednesday’s panel was co-sponsored by the Northwestern University Community for Human Rights, the Sheil Catholic Center, the Fight for 15 campaign, the Chicago Coalition for the Homeless, the Center for Civic Engagement and the NU Hillel service organization ZOOZ. The panel also included Gloria Davis, a worker with the Chicago Coalition for the Homeless who lives on the minimum wage, and SESP Prof. Diane Whitmore Schanzenbach a fellow at the Institute for Policy Research. Both Davis and Salgado described the day-to-day struggle of living on a minimum wage. Davis told students to close their eyes and imagine themselves in the dead of winter, going to work at a meat packaging plant for $8.25 an hour, the minimum wage in Illinois, as a temporary worker with no benefits. Davis has testified in front of the Illinois legislature, spoke with Illinois Gov. Pat Quinn in support of the referendum and spoke at the bill-signing ceremony. Salgado said the issue boils down to providing a better life for her children, one of whom was sitting beside her at the event. A February Congressional Budget Office report on minimum wage increases showed a nationwide minimum wage increase to $10.10 would cause two outcomes. First, about 33 million low-wage workers would earn $31 billion more in total. Second, 1.5 percent of those workers would lose their jobs as a result of the increase. She said economists now agree that the economy can handle a 15- to 20- percent increase in the minimum wage without a significant increase in unemployment. Both Davis and Salgado also mentioned the increase in wages would be used to stimulate the economy. Salgado urged the audience to spread awareness about the campaign, and to ignore negativity surrounding it. “We’re fighting for what we believe,” she said.